If there’s one thing Colin Cowherd knows, it’s holding bizarre years-long vendettas against certain athletes. See: Wall, John. That criticism led to a face-to-face confrontation when Mayfield was a guest on Cowherd’s show this summer and the quarterback stood up to the sports radio shock jock in a testy exchange. 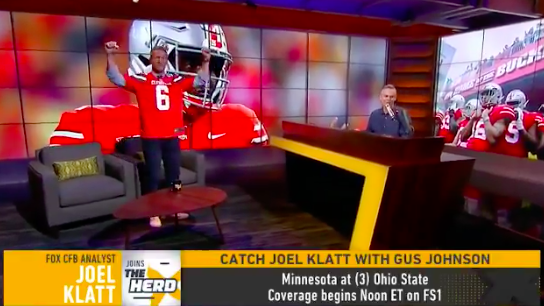 Now that the pair has traded jabs on air, this has officially become “a thing.” In an appearance on Cowherd’s show today, Fox college football analyst Joel Klatt decided to poke a little fun at the host by wearing a Mayfield Cleveland Browns jersey after an overtime win against the Ravens on Sunday. Klatt is a very good analyst and rubbing Mayfield’s success in Cowherd’s face should only make him a more popular figure in the football world. Because, let’s face it, trolling Colin Cowherd’s hot takes in any way is automatically going to make you more popular no matter what. As for Mayfield and the Browns, this is probably something Cowherd should get used to because they actually might be a decent football team. Mayfield has already doubled Hue Jackson’s win total from the previous two seasons combined. And they have a tie! In fact, as crazy as it sounds, the Browns probably should be undefeated. As for Cowherd’s next target… I’m going to go out on a limb and predict it’ll be Paul Pogba.